More 18th-century cats: it has to be said that the works of the High Enlightenment were arid reading for cat lovers! The authors of the Encyclopédie were savants and men of science who approached their subject with seriousness. In the Article CHAT (Myth) Diderot, with Herodotus in hand, inquired into the place of cats in mythology, particularly that of Egypt. In this great and strange civilisation the cat was worshipped "in its natural form, or in the form of a man with a cat's head". To kill a cat, even by accident, was a crime that was "severely punished". This brief treatment was the final article in the section on "cats" which takes up four-and-a-half columns in all. Consideration begins with CHAT s.n. felis, catus (Hist.nat.) by Louis Dubenton, completed by Jaucourt. Gabriel François Venel then devoted two columns to CHAT (Matière médicale). Finally there were three anonymous lines on the use of cats fur by furiers "principally" for sleeves. According to Dubenton, although cats are domesticated, they belong to the category of animals that are "wild and ferocious" such as lions, tigers, leopards and .....bears. ( Jaucourt in QUADRUPEDE also likened cats and bears, on the basis of the shape of their heads and similarities in dentition).Daubenton insists on their natural savagery:. "There are wild cats [..] and there is reason to believe they would all be wild if they had not been tamed". 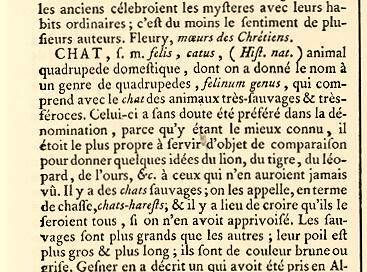 Jaucourt adds details concerning feline anatomy. He refers to the discussions which took place in the Academy of Science between 1704 and 1712 concerning cats' eyes and the capacity of their pupils to narrow and dilate. He considers cats' retractable claws and also addresses the longstanding question of why a cat always lands on its feet (Fear alters its centre of gravity!). He also tackles the light generated by brushing their coats, referring his readers to the article ÉLECTRICITÉ by Le Monnier. Venel adds little, merely listing parts of the cat - fat, blood, urine, coat - used in remedies and their supposed efficacy, which has never been the subject of experiment. 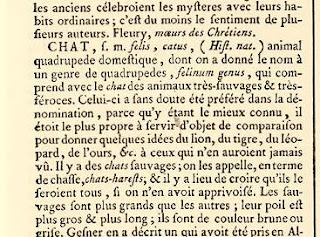 Buffon's treatment of cats in Volume Six of the Histoire naturelle appeared only shortly after the relevant volume of the Encyclopédie (1756, as opposed to 1753) and had very little to add in terms of zoological information. Of most interest is the panorama of different breeds, both from Europe and further afield, in Canada, North Africa, Madagascar, Persia, Syria and China. Buffon confirms that cats love to eat fish and treats us to detailed comparative measurements of the intestines of wild and domestic cats. He touches briefly on cats' vision and the electric properties of their coats. He at first claimed that cats slept less than they appeared to do but, ever conscientious, he later renounced this view. The Supplement of 1774 solemnly published a letter from a Dijon engineer called Pasumot. who regularly shared his bed with a cat and could vouch for its genuine deep sleep. "Domestic cat" from vol.vi of the Histoire naturelle. Buffon himself was certainly no cat lover. The cat, he wrote unkindly, is a "faithless" domestic animal which is tolerated only through necessity to keep down mice and other vermin. Although cats may seem "pleasing and gentle" when young, they possess an "innate cunning and a perverse disposition" which contrasts unfavourably with the unquestioning loyalty of.dogs. The taste for liberty which Buffon admired in wild animals is presented, rather unfairly, as a vice in cats. The cat is a faithless domestic, and only kept through necessity to oppose to another domestic which incommodes us still more, and which we cannot drive away; for we pay no respect to those who, being fond of all beasts, keeps cats for amusement. Though these animals are gentle and frolicksome when young, yet they even then possess an innate cunning, and perverse disposition, which age increases, and which education only serves to conceal. They are naturally inclined to theft, and the best education only converts them into servile and flattering robbers; for they have the same address, subtlety and inclination for mischief or rapine. Like all knaves they know how to conceal their intentions, to watch, wait, and choose opportunities for seizing their prey; to fly from punishment, and to remain away until the danger is over and they can return with safety. They readily conform to the habits of society, but never acquire its manners; for of attachment they have only the appearance, as may be seen by the obliquity of their motions and the duplicity of their looks. They never look in the face of those who treat them best and of whom they seem to be the most fond, but either through fear, or falsehood, they approach him by windings to seek for those caresses they have no pleasure in but only to flatter those from whom they receive them. Very different from that faithful animal the dog, whose sentiments are all directed to the person of his master, the cat appears only to feel for himself, only to love conditionally, only to partake of society that he may abuse it; and by this disposition he has more affinity to man than the dog, who is all sincerity. Buffon is clearly guilty of anthropomorphism. 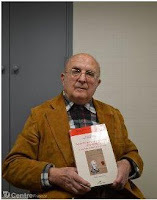 His pretensions to impartial observation are betrayed by his recourse to psychological analyses and moral judgments which are appropriate only to human motivation As Professor Ehrard notes, the vocabulary is very similar to that used by classical moralists about women, who were considered seductive, but sensual and deceitful. In effect, Buffon is simply repeating the commonplace view that identified cats as malign, even Satanic. Traditional prejudice has merely assumed an enlightened veneer.. This post is mostly taken from an article published in 2004 in Dix-huitième siècle by Jean Ehrard, retired professor from the Université Blaise-Pascal in Clermont-Ferrand and author of the phenomenally learned L'Idée de nature en France à l'aube des Lumières . We learn he was also the owner of Attila, Minouroux and Minestrone!